A quiet revolution is taking place in South Gloucestershire Council where digital technology and home-grown innovation have been combined to deliver a transformation in the way public services are communicated. The result is eDocs, or electronic documents, which offer an agile, quick and cheap alternative to traditional design and print. Crucially though, eDocs also deliver massively enhanced accessibility since they can be read on any device from laptops to smartphones, with the documents adjusting automatically to the screen size. They can also be downloaded and read on a Kindle. Since eDocs were introduced at the authority a little over a year ago the technology has resulted in the council printing some two million fewer pages, delivering a real breakthrough in reducing costs and waste. This equates to a saving of more than £170,000 (double-sided and in colour). eDocs incorporate a piece of software, Browsealoud, which means you can listen to the document being read out or have it translated into more than 140 languages. eDocs will also let you change the font size and colour contrast to suit your needs and you can easily share the document with others by email or on social media. The breakthrough principle has been to create documents that are digital by design and live; anyone accessing them online will always see the latest version. And the other great thing about the eDoc is that it was developed in-house by South Gloucestershire Council’s Digital Services team at only the cost of the team’s time. All these programmes already exist. The innovation on the part of the officers involved was figuring out how to bring them together and make them work as one. The ability to adjust the contrast, listen to an audio version or have it translated into any language means that eDocs are accessible to all. They can also be printed if required. This is a list of the separate pages that make up the eDoc. You can click on any one to go straight to that page. This gives you the option to create a PDF version of the eDoc in either standard or large print. You can use this to print out the whole or part of the document, or save it to your computer or mobile device. If you want other people to know about the eDoc, choose Share and then you can post on Facebook or twitter (with the address automatically added), add to your Google+ account or just email to someone. Looking for something specific? You can enter keywords to search the eDoc. Change the way the eDoc looks to suit your needs. You can change the contrast, increase the size of the text and increase the spacing between lines. eDocs is an innovation that we are very proud of and one that we are currently considering making available to other authorities. 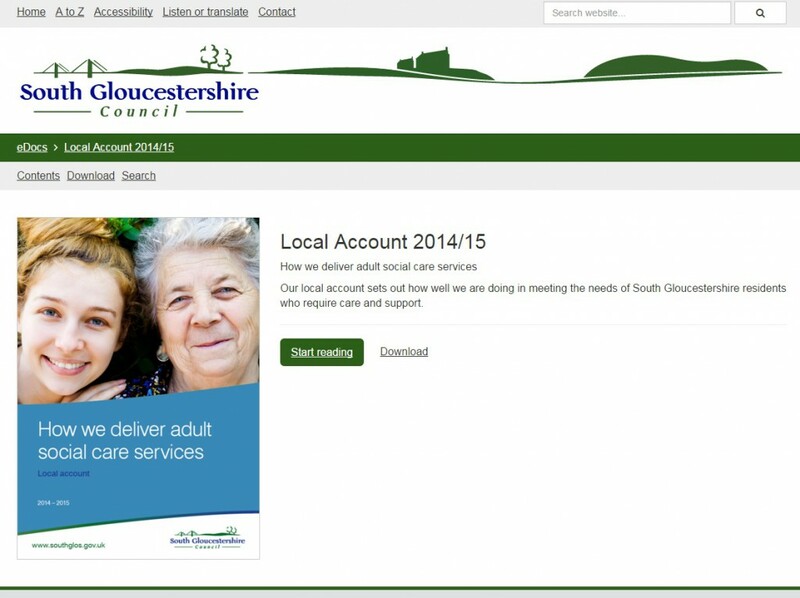 It is currently being rolled out across South Gloucestershire Council services, allowing staff to create their own documents and helping us to deliver on our pledge to continue to deliver value for money and essential services at a challenging time.